Sorry for the long post, but there is a story and lesson from today's swim that I think are important to share. I met Gords, Goody and Chad for our usual Thursday swim at the marina. It was a little cool outside, but the water temp was about as warm as it has been all year at 58 degrees. I got to talk to some people from Bountiful who had brought out some visitors from Norway to see the lake. We talked for quite a while and the people from Norway seemed to be pretty impressed with the lake. That is one cool thing about hanging out at the marina, you get to meet a lot of cool people from all over the world. I was doubled up on GPS devices today. Here is the link to the data and map from my Hydro Tracker. A total of 3,765 yards (2.14 miles). It would have been about 2.2 miles if not for the story I am about to share. The water was 58 degrees today, which I think was warmer than the air temperature. It was noticeably warmer when I got in and started swimming. There was a crowd of people gathered to watch us swim out of the marina, which is always kind of fun. We swam down to Black Rock and I felt great. At Black Rock, Gords and I waited for briefly for Chad and Goody to catch up. Not moving for even that short time, I started getting cold and was anxious to get moving again so that I could warm back up. At about 1/4 to 1/3 of the way back to the marina, I noticed that I wasn't thinking straight. I kept swimming for a while, but an almost overwhelming feeling of panic came over me. I felt like I was on the verge of losing control so I stopped and tried to calm down. I thought about swimming into shore or swimming back to to Black Rock and trying to hitch a ride with the car that was parked there. Goody swam over and asked if I was alright. I think my response was "I don't know". Goody waved Chad over to help. Chad, I learned, is an EMT and asked if I was ok. He did a good job of getting me to calm down and asked me some basic questions to see how I was doing. He told me to focus on only good things so I tried to picture Sabrina in my mind. With that I was able to calm down enough to start swimming with Chad and Goody on either side. I prayed as I swam that I would be able to make it back to shore. After a while the panic started coming back and I kept stopping. 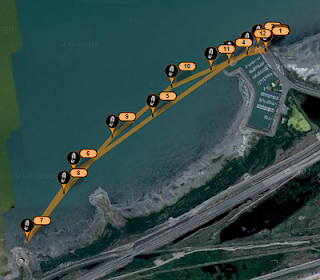 By this time Gords must have figured something was wrong because he slowed down and was swimming next to me. I started shivering and feeling light headed. I have never passed out, but I think I may have been close. It was such a strange feeling and I don't know how to describe it other than I knew I was not thinking straight. We were getting close to the marina but I couldn't swim for more than about 25 yards at a time. Chad, Goody and Gords gathered around and Chad asked me simple questions again to make sure that I was still ok. He told Gords to swim ahead and get my towels ready and get his car warmed up. I turned over on my back and held onto my Safe Swimmer. With Chad and Goody on either side, they towed me the rest of the way to the shore while I kicked. They kept talking to me and asking me questions which helped a lot to keep me calm and take my mind off of the situation. All I could think about was getting OUT of the water. After what seemed like a long time, we got to the rocks at the end of the marina and I was able to climb out on my own. When I got to the top I saw Gords running towards me with my towel and clothes. He helped me get dried off and dressed and we walked back to his car which he had already warmed up. After a while of sitting in the car with the heater blazing I started feeling better. Chad checked my pulse periodically and seemed to be happy with my progress. I wasn't watching the clock, but after what seemed like a short time I was talking to Sabrina on the phone and texting on my phone with no problems. I am still trying to figure out what went wrong. I though maybe the panic had something to do with a thyroid problem that I take medication for, but that doesn't explain the confusion and feeling like I was going to pass out. From what I have read about hypothermia, I think I was well into the first stage. The only thing I can think that would have caused it is being in the water for too long. The longest I have been in the water this year was about 50 minutes and by the time I climbed out today, I had been in for an hour and 20 minutes. The water felt pretty good when I first got in, but I think I was just exposed for too long. I am lucky to have such good friends who took control of the situation and helped me to stay calm and get me out of the water and warmed up. I would not have tried that swim alone at that water temperature but I hate to think about what would have happened if they weren't there. I am grateful to God, who I know heard my prayers and was watching over me. I don't feel like I was being reckless at all. I was swimming with other people and had my Safe Swimmer on. I have also been swimming with these guys in cold water all year with no problems and should have had no problem at 58 degrees. I'm not going to let this one bad experience keep me from doing what I love but, until the water and weather warms up a little more, I will be a little more conservative with how long I am in the water. I will also stick to swimming near the marina and maybe just do laps between the buoys. The lesson of this story is to be careful and plan ahead, especially in cold water. Open water is pretty unpredictable, which is one of the things I love about it, and you have to be prepared. Be sure that you are swimming with someone else and that you let someone know where you are and when you expect to be done. I would also recommend choosing a route near the shore so that you can get out quickly if you run into problems. I also highly recommend swimming with a Safe Swimmer or other similar safety device. If you are as lucky as I am, you will swim with good friends who know how to help you when you get into trouble. My guess is your wait at Black Rock was too long. When swimming in cold water, you need to keep your engine running producing heat to counteract the cold water. Once you shutdown your internal heat, cold already in your outer tissues moves inward causing hyperthermia. It does not long for you to lose core temps. Glad you're okay. Will, I have come to the same conclusion. The fact that the air temperature was lower than the water temperature when we were stopped probably didn't help either. Holy crap! I'm glad you are OK and you had the other guys there to take care of you. I had been on the fence about buying a safety swimmer, but I think it's official now. I'm buying one for sure... You guys still selling them? Matt, I sold all of the Safe Swimmers that I had last year and haven't ordered any more. You can get one from my friends at Swim Las Vegas www.swimlasvegas.com. Glad you are okay. I've shared your story with all my open water swimmer friends. We bought Safe Swimmers last year because of you and many of us have enjoyed your clinics. Thanks for all you do for the sport. Thanks Tracey! We are planning more clinics, group swims and casual open water "races" this year and I hope to see you there! Thanks for sharing the story, Steven has passed it on to me as I am up to swim ~550Km starting in May as part of my triathlon. I am in Europe, do you know where I can get these Safety Swimmers around here? I have shared the story on my page so others can take the value out of it as will. Thanks again for sharing it.